If I were stranded on a deserted island, and had to choose one food to eat for the rest of my life, I might very well choose pesto. I get all weak-in-the-knees, just thinking about it. All pesto is good, but my favorite comes from an amazing local restaurant, and they just happen to stock it in some local supermarkets. Normally I'm a "dip sinfully white flat bread into the pesto" kind of gal. But I got to wondering what might happen if I put the pesto into some bread itself. Eliminate the pesky tear-and-dip part of the process. 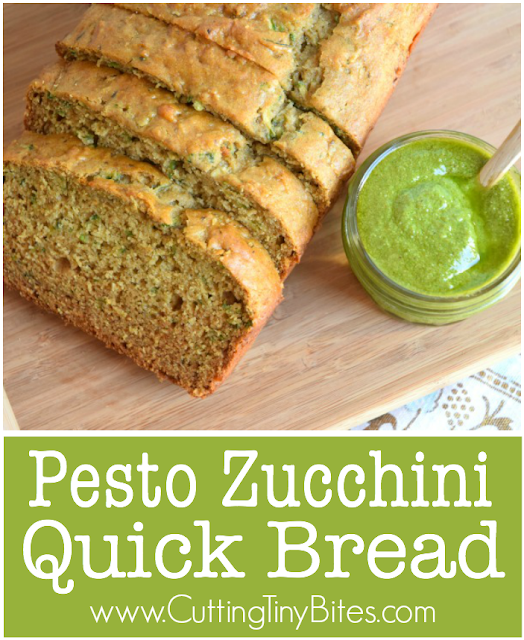 So that's where this recipe for Pesto Zucchini Quick Bread came from. I know it may sound unusual, but it is oh-so-delicious. 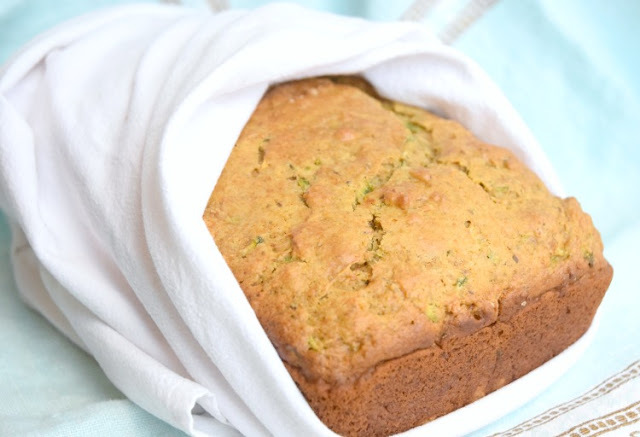 You can't taste the zucchini, but it just adds a little nutrition boost and helps to make the bread melt-in-your-mouth moist. 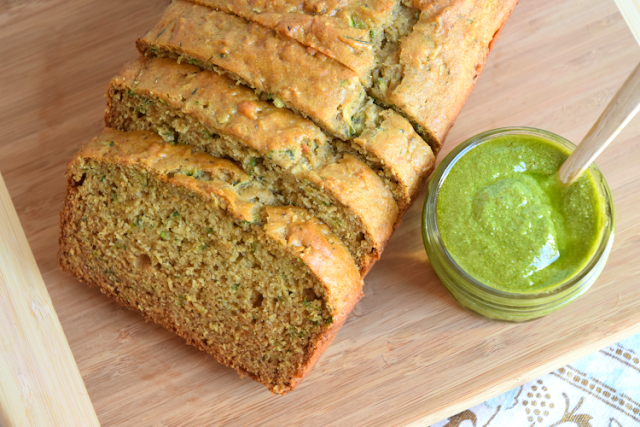 You CAN taste the pesto, though, and it gives the bread a rich, flavorful quality that will leave you wanting more! Try a slice with an afternoon cup of tea or for a quick breakfast. Preheat oven to 325. Prepare a 9" x 5" loaf pan with non-stick spray or parchment paper. 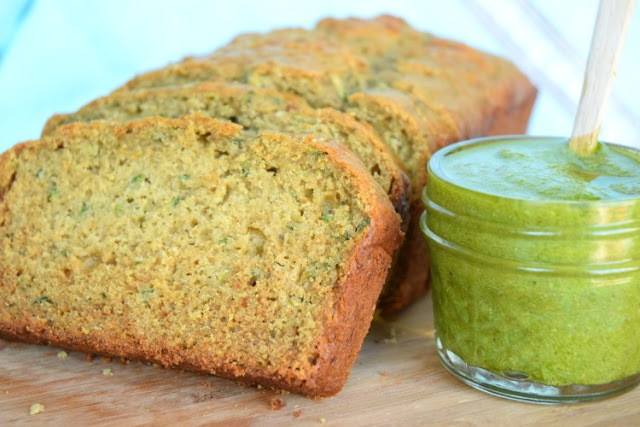 In a medium mixing bowl, combine zucchini, pesto, eggs, honey, and oil. Stir until well combined. In a large mixing bowl, combine all purpose flour, white whole wheat flour, baking soda, and baking powder. (The pesto I used was very salty, so the recipe didn't need any additional salt. Add 1/2 teaspoon of salt if your pesto isn't terribly salty.) Stir dry ingredients. Make a well in the center of the dry ingredients. Pour in the wet ingredients, and stir until just combined. Don't over mix. Pour into loaf pan. Bake for 45-55 minutes, until top is golden brown and a skewer entered in the center comes out clean. Allow to cool in the pan for 5-10 minutes, then transfer to a wire cooling rack.